Osteoarthritis, a disease that causes severe joint pain, affects more than 20 million people in the United States. Some medications may help relieve pain, but no treatment can reverse or slow the cartilage degradation associated with the disease. 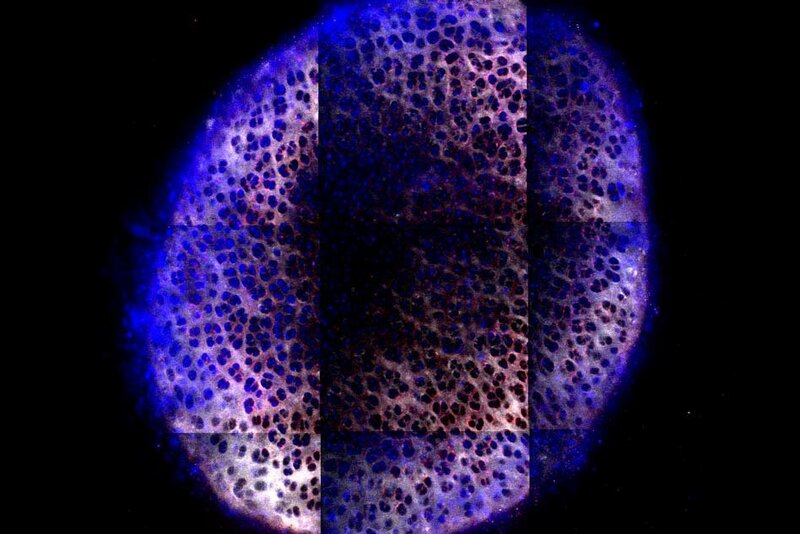 In an advance that could improve treatment options available for osteoarthritis, MIT engineers have designed a new material capable of delivering drugs directly to cartilage. The material can penetrate deep into the cartilage, releasing drugs that can heal damaged tissue. "It's a way to directly reach the affected cells and introduce different types of treatments that can change their behavior," says Paula Hammond, head of MIT's Chemical Engineering Department, a member of MIT's Koch Institute for Integrative. Cancer Research, and the main author of the study. 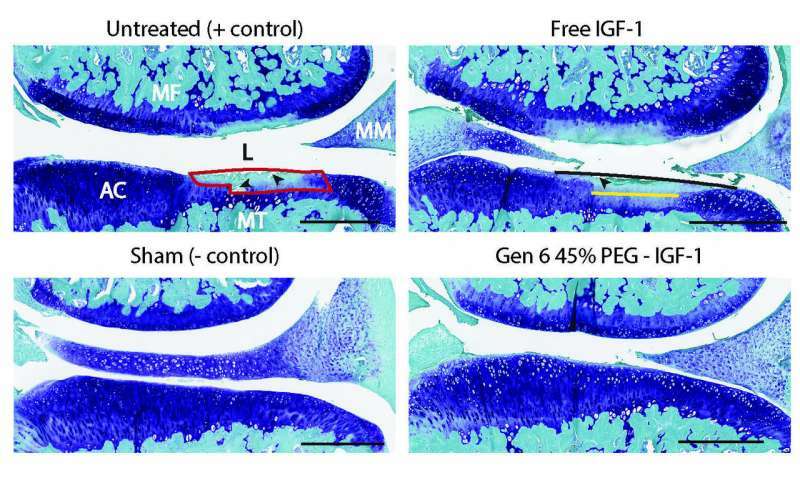 In a study in rats, the researchers showed that the administration of an experimental drug called insulin-like growth factor (IGF-1) with this new material prevented cartilage degradation much more effectively than the injection of the drug into the joint. Brett Geiger, a graduate student at MIT, is the lead author of this article, published in the November 28 issue of Translational medicine science. Other authors are Sheryl Wang, a MIT graduate student, Robert Padera, associate professor of pathology at Brigham and Women's Hospital, and Alan Grodzinsky, professor of biological engineering at MIT. Osteoarthritis is a progressive disease that can be caused by a traumatic injury such as tearing a ligament. it can also result from progressive wear of the cartilage with age. A smooth connective tissue that protects the joints, cartilage is produced by cells called chondrocytes but can not be easily replaced once damaged. 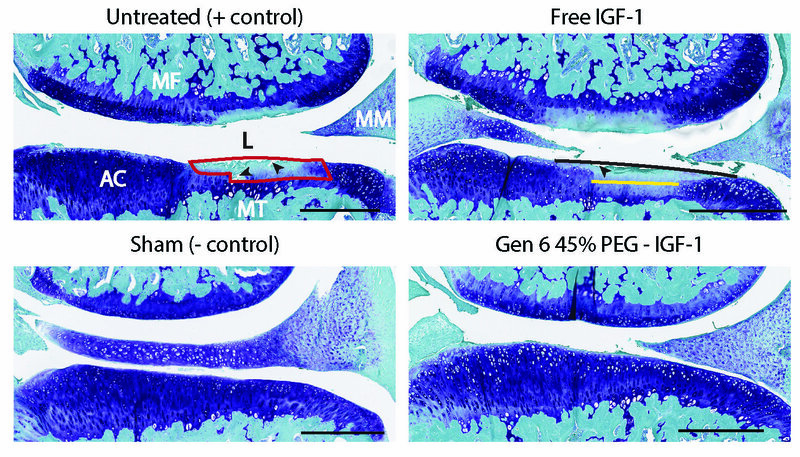 Previous studies have shown that IGF-1 can help regenerate cartilage in animals. However, many osteoarthritis drugs that have shown promise in animal studies have not shown good results in clinical trials. 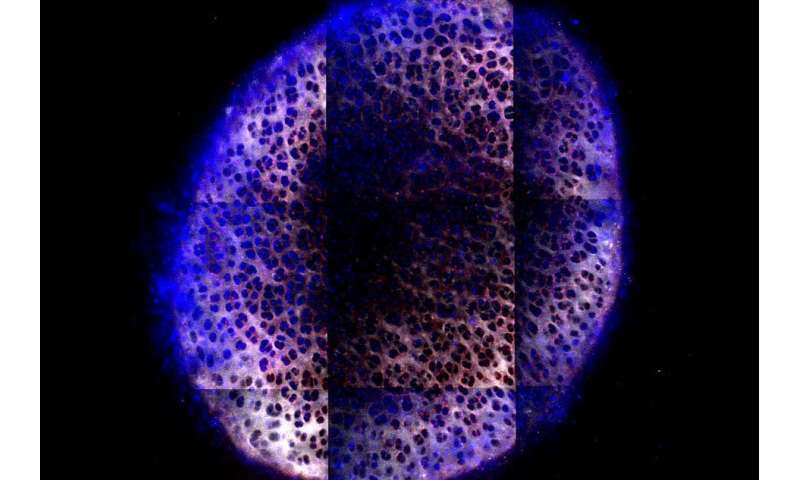 The MIT team thought it was because the drugs had been removed from the joint before they could reach the deep layer of chondrocytes that they were supposed to target. To overcome this problem, they designed a material capable of penetrating through the cartilage. The sphere-shaped molecule that they created contains many branched structures, called dendrimers, that branch out from a central nucleus. The molecule has a positive charge at the tip of each of its branches, which helps to bind to negatively charged cartilage. Some of these fillers can be replaced by a short, flexible, water-loving polymer called PEG, which can oscillate on the surface and partially cover the positive charge. IGF-1 molecules are also attached to the surface. When these particles are injected into a joint, they cover the surface of the cartilage and then begin to diffuse through it. It is easier for them than for free IGF-1, because the positive charges of the spheres allow them to bind to the cartilage and prevent them from being washed. The charged molecules, however, do not adhere permanently. Thanks to the flexible PEG chains on the surface that cover and uncover the load as they move, the molecules can detach themselves from the cartilage briefly, allowing them to sink deeper into the tissue. "We found an optimal load range so that the material could both bind to the fabric and bind it for subsequent diffusion without being too strong to stick to the surface," says Geiger. Once the particles reach the chondrocytes, the IGF-1 molecules bind to receptors on the surface of the cells and induce them to produce proteoglycans, the building blocks of cartilage and other connective tissue. IGF-1 also promotes cell growth and prevents cell death. When the researchers injected the particles into the knee joints of rats, they discovered that the material had a half-life of about four days, 10 times longer than the IGF-1 injected alone. The drug concentration in the joints remained high enough to have a therapeutic effect for about 30 days. If this is true for humans, patients could benefit greatly from joint injections, which can only be administered every month or every two weeks, according to the researchers. In animal studies, the researchers found that the cartilage of injured joints treated with the nanoparticle-drug combination was much less damaged than cartilage from untreated joints or treated with IGF-1 alone. The joints also showed a reduction in joint inflammation and bone spine formation. The cartilage in rat joints has a thickness of about 100 microns, but the researchers also showed that their particles could penetrate into pieces of cartilage ranging up to 1 millimeter, the thickness of the cartilage in a human joint. "It's a very difficult thing to do. The drugs will usually be removed before they can get through much of the cartilage, "says Geiger. "When you start to think that this technology, derived from studies on rats, can be used in larger animals and sometimes in humans, its ability to succeed depends on its ability to work in thicker cartilage. " Researchers have begun to develop this material as a way to treat osteoarthritis occurring after traumatic injury, but they feel that it could also be suitable for treating age-related osteoarthritis. They are now considering exploring the possibility of delivering different types of drugs, such as other growth factors, drugs that block inflammatory cytokines, and nucleic acids such as DNA and DNA. ; RNA.